If you are looking for the best and easiest way to make coconut oil vegan puff pastry, this is it! Ready for desserts, vegan crossaints and everything in between. This week must be ‘how to’ week, since we started it off with how to make a flax egg, and now we’re moving onto vegan puff pastry! I’ve done a few of these ‘how to’ posts in the past, one was on making the best cashew cream frosting and the other was all about that amazing vegan chickpea meringue that has been floating around the internet. I’ve had vegan puff pastry on the mind for a while, but finally got around to experimenting and actually making it. I had to go through a few trials to get this vegan puff pastry dough just right, but in the end, I totally nailed it! Let’s dive deeper, shall we? Traditional puff pastry uses a basic dough recipe that’s made from flour and water. Then, a slab of cold butter is repeatedly folded into the dough until the pastry has dozens of layers. 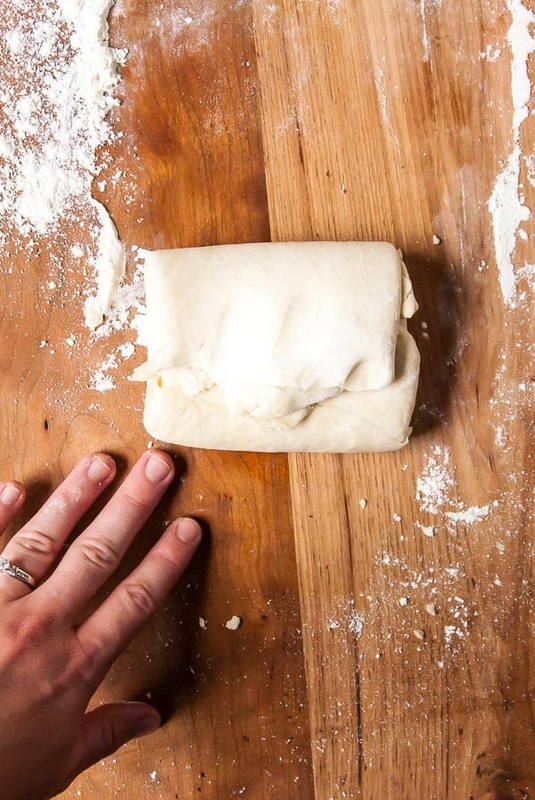 The key to making regular puff pastry is to chill the dough every time you roll it out. So this means you could be rolling out the dough and chilling it upwards or three or four times before the pastry is ready to be shaped and baked. The real magic of puff pastry happens in the oven; the flat pastry transforms into a fluffy, airy, buttery treat when baked. The pastry is able to puff up thanks to the steam that’s released from the butter and water in the dough. But while this chemical reaction is interesting to read about (and tastes delicious, to boot), it took me quite a few tries to find an oil substitute that perfectly mimics the butter that’s typically used in puff pastry. I had a few trials and tribulations with this dough recipe. First, I wanted to see if cold olive oil would work in puff pastry dough, thinking it would provide a nice, solid fat to take place of the butter in the usual recipes. Nope. The higher liquid content in olive oil combined with a hot day plus me trying to cram it into getting it done before rushing to yoga class, just didn’t work out. Olive oil might be perfect for a pie crust or something that tends to be a bit drier by nature, but puff pastry just wasn’t the right match for it. Moving on! Next, I used half whole wheat flour and half all-purpose flour in one batch of the dough, trying to see if the method I normally reserve for making cookies would work. Strike out again. Delicate pastry doughs are just that, delicate doughs. Don’t try to beef them up with whole wheat flour and make them disguise themselves as a healthy-ish treat. They aren’t going to be and don’t even try to force it. I’ll save you the pain and heartache and tell you, it’s totally not worth it! Now, I’m here to tell you that I wanted to make a vegan puff pastry dough without vegan butter. 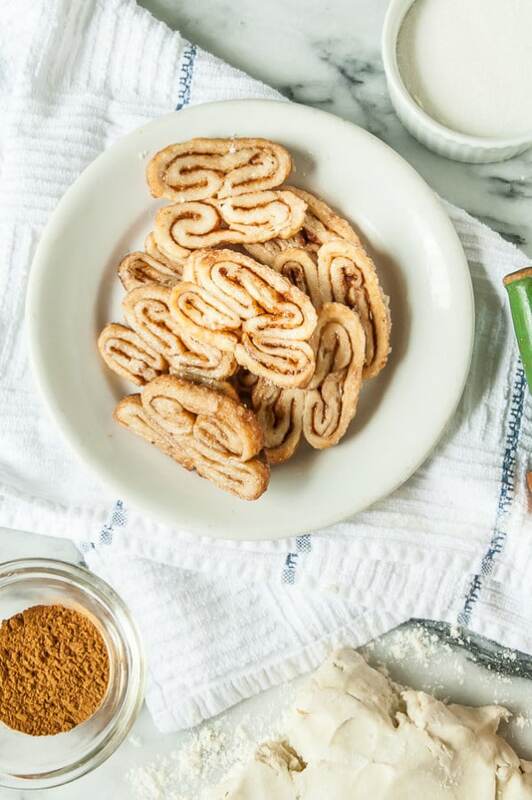 I really don’t keep the stuff around and don’t want to buy it just to make a batch of puff pastry dough, so I wanted to see if it would work with my favorite baking fat, coconut oil! 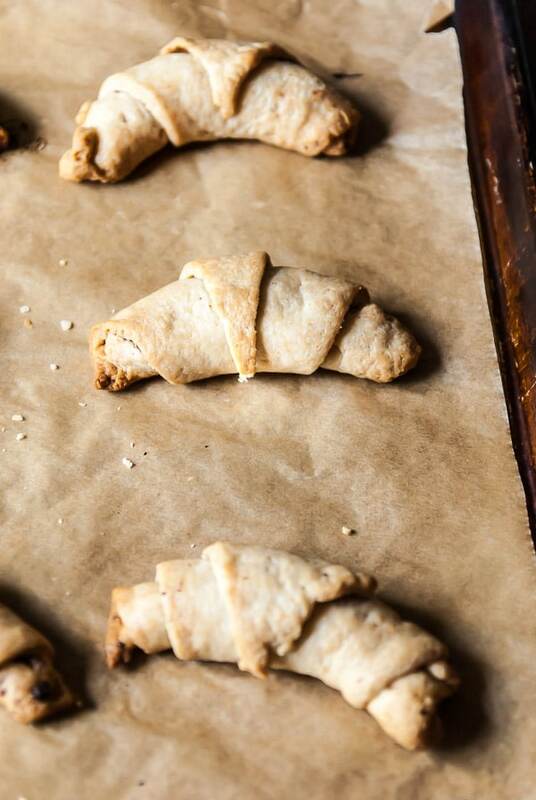 Turns out, coconut oil is perfect for replacing butter in a quick vegan puff pastry. The fat structure and way it is used in the dough turns out perfectly, so it’s a great replacement for the usual sticks on sticks of butter in the dough. Make sure your coconut oil is cold and isn’t super liquid-y, because that just won’t work. Also, get the good stuff, because you might taste a hint of it in this dough. Think about how solid butter is just it’s just past being taken out of the fridge, still pliable, but not melting on the counter. If you want to make butter-free puff pastry, this is the recipe for you! For me, the day I made my puff pastry dough it was hot outside, so I had to pop my coconut oil in the fridge for a while to get it to firm up. If it’s cold outside, you may have to warm it up just a bit to get it to be pliable. If the weather is mild or your kitchen stays cool, you may not have an issue with this at all. Speaking of warm weather, if the dough starts to warm up and get really sticky, stick it back into the fridge for a few minutes and let it take a chill. No one likes to wrestle with warm dough, and if the coconut oil gets too warm in the dough, things are going to start getting mushy and you will start heading up struggle street with your puff pastry. This is another reason olive oil puff pastry didn’t work out for me; it became too mushy and watery quickly, rather than turning into the perfectly flaky pastry this coconut oil vegan puff pastry turned out to be. I will tell you that this is a quick method of making puff pastry, so there won’t be any making of butter squares (as the longer, more involved traditional process has you do), but there will be a pretty easy dough that you make and use anytime. The instructions are going to look long and time intensive, but the main idea behind puff pastry is that you are rolling out the dough and laminating (folding) it multiple times, to build those perfect flaky layers of fat and dough. 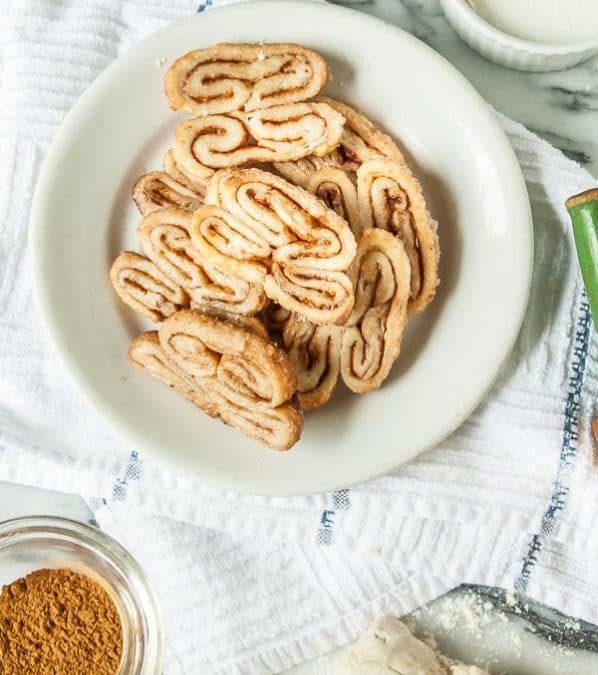 When the dough is baked up, the layers get puffed up and end up being flaky and perfect for a batch of fancy puff pastry cookies (shown above) or a super quick croissant. I do have a more true croissant recipe coming, so sit tight if you are hankering for a real deal vegan croissant recipe. So if the recipe below looks like it’s way too hard or will take too much time, just remember that a lot of it is fridge time, rolling, laminating, and just waiting. You can also make this and keep it on hand to make a quick savory tart or sweet puff pastry pillows filled with jam, whatever your heart desires. Go forth and get to rolling! If you are looking for the best and easiest way to make coconut oil vegan puff pastry, this is it! Perfect for vegan crossaints and desserts. In a large bowl, stir together the flours and salt. Using your hands, cut in the coconut oil until crumbs the size of large peas are formed. For this, I just dropped the coconut oil into the flour mixture and broke it up with my hands until it was broken down into the large pea size. Add the cold water and stir together until the mixture comes together into a dough. If the dough seems a bit dry, add just a tad more water until it comes together. Pat into a loose ball and transfer the dough to a well floured surface. Dust the top of the dough liberally with flour and form into a rectangle that is 3/4 inch thick. Roll the dough into a rectangle 12 inches long by 7 inches wide and 1/2 inch thick. With the short side facing you (the 7 inch side), fold the bottom third of the dough up and the top third down, like you are folding a letter. Rotate the folded dough a quarter turn (so the folded side is to your left) and repeat. Roll out and fold up again, repeat one more time after that (for a total of 3 times). Wrap in plastic wrap and refrigerate for 4 hours before shaping or using for a recipe. Dough can be frozen for up to a month. Yay for coconut oil! I love it so much- the only natural non-animal saturated fat 🙂 This is an awesome recipe, Abby! I know, right?! Thanks love! As I was reading this I was thinking, “Wow, Abby’s like a scientist.” It’s really cool that you’re sharing all the trial and error, and saving us from the heartache. Though I fear this puff pastry may be completely out of my league. YAY!!! That is exactly what I was going for, something that didn’t use butter and it much easier than trying to hunt down something weird and take a lot of time. ENJOY! What do we bake this at? Using coconut oil is so smart + I bet it gives such a great flavour/texture. I’m a little scared of trying puff pastry but I have it on my list to conquer this year (and then – maybe – a gluten free version…). Ohh man, you would be a goddness if you cracked the gluten free pastry code! Coconut oil saves the day again! It is an amazing food and I’m so excited to see you’ve made puff dough using it! I can see using this is so many applications! Way to go Abby! I love coconut oil and have always wanted to try making my own pastry! Great recipe! Coconut oil is the BEST, right?! I have been dreaming of homemade Morning Buns, but have been scared to try. You may just have given me the courage! Oh my gosh, finally! I’ve been thinking of making vegan pastries for a while now but just didn’t have the time to experiment with making my own vegan puff pastry without the vegan butter. This is perfection and I can’t wait to try it out! Girl, you are rocking these tutorials! Seriously, keep ’em coming – they’re super helpful! I love that coconut oil was the answer to the vegan butter dilema. I always have a supply on hand and know how marvelous it makes baked goodies. Now I’m craving alllll the puff pastry! This is so great, Abby! I’ve been curious about using coconut oil in pastry dough + plus using it with gluten-free flours. Can’t wait to try it out! Just one question. Will this only work for sweet savouries? Hi! 🙂 I just made this today & froze it for future use. I’m so excited about it, because the store-bought stuff, although vegan, isn’t nearly as healthy as this. I do have a question for you, though, & it may sound silly… When you’re rolling it out into a rectangle, how do you get it to stay in the shape of a rectangle? Mine always ends up as an amorphous blob. Then I have to take my pizza cutter & trim the edges. I don’t want to waste that dough, so I try to stick it on the end. It doesn’t work that well; it doesn’t want to stick onto the rest of the dough. I mean, I know I’ll never get perfectly straight lines, but what am I doing wrong? Or if you have the same problem, what do you do? Anyway, thanks a million for this recipe (I’m SO glad I found this site! ), & thanks for making my hands smell like yummy coconut today, LOL. Ah, thanks for the tip! Will this recipe work with spelt flour? And when done, which temp should I be baking at? Hi Maya! I haven’t tried it with spelt flour, so I don’t know, but if you do please let me know! I would recommend if you use spelt to add a little more liquid to the dough to keep it pliable. Bake at 350! Hi, how do you store it? Folded or flat? Do the layers come apart easily after it has been frozen? Not much experience with this, but am going to try it! Hi Ruth! You can store it folded, wrapped in plastic wrap. I’m not sure about how it would come apart after being frozen, but if you try it let me know! Best of luck, please let me know how it goes! This recipe is totally amazing! I’d been trying to find a perfect dough like this for ages and finally, Abby – the master of the baking science, saved my vegan-friendly pastry… I adore you!! That makes me so happy to hear! Enjoy Evka! Oh no! Can you tell me what you had issues with and I might be able to troubleshoot? can u post a video for it please? Can I switch the all purpose flour for chickpea flour in the vegan puff pastry recipe? 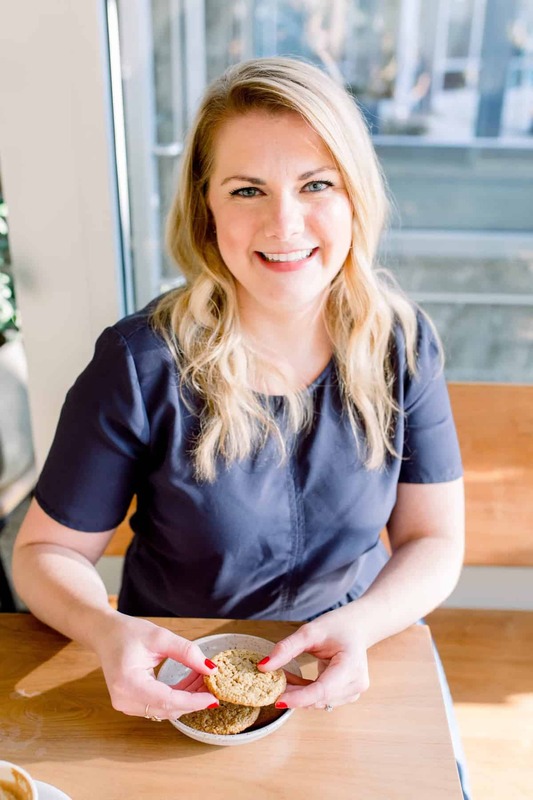 Hi Laura, I wouldn’t recommend that, since I haven’t tried it, but if you want to make it gluten free I would recommend trying a GF flour blend! I tried the recipe today, and when I took the pack out of the fridge it is not malleable. Is there something i need to do to it so that I can thin it out to use? Hmm, you might try to let it thaw out a bit before rolling out! Thanks….I did. It did roll out better, but did not rise well…..I think it was too dry….the next batch will be better! Hi….finally found a recipe that uses coconut oil instead of the butter 😊 Cant wait to try it! Always…can i freeze it up before using it in the recipe? It would be helpful if some advice were given as to best baking temp and times to not burn it, as well as suggestions on usage. How strong it it? What kind of fillings will it hold? Thanks! Have you done any testing on refined and unrefined coconut oil? I’m guessing that probably plays a factor in the crumbliness? I used refined and the dough is very crumbly and doesn’t hold well together. So I’m thinking that’s because of the lower fat content. I haven’t gotten around to baking it yet but another commenter who experienced crumbly dough said it baked fine in the end so I’m hoping mine does too! Oh no, I hope it does too! I usually use unrefined, so I’ll be sure to note that next time I go back to test it! So lot of commenting but has anyone made this? Questions: 1. what temp generally would you use to bake this; 2. I’ve had coconut oil melt at room temperature, do you refrigerate it first? Hi john, Typically you would bake at 350 degrees F. If you coconut oil is liquid, refrigerate it for a bit first! I haven’t! It would probably work if you increased the liquid a bit!